Of course this was going to happen, Android 4.3 has been out only a day and people are already finding hidden features. 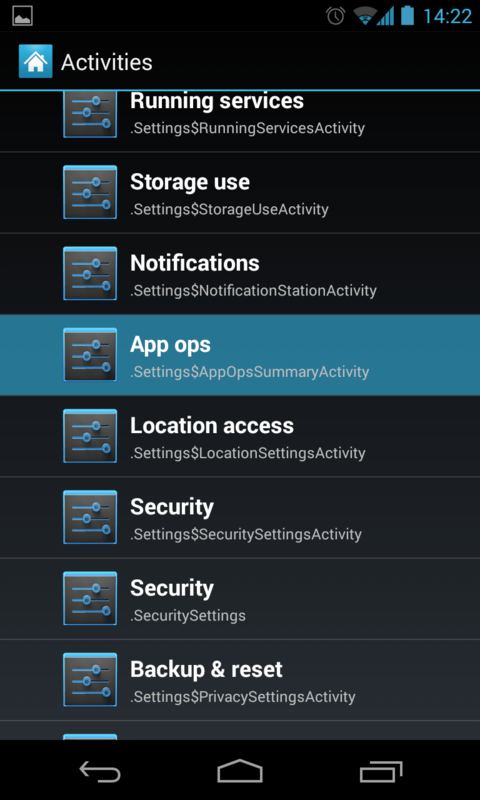 In this case, Android Police is reporting a feature called "App Ops", which allows you to enable/disable what permissions your apps can access, on a per app basis. For example, if you have an app that's constantly trying to find you location and it's eating up your batter, you can simple disable the Location permission for that app and you're done. Google hid this feature because it's obviously not ready for prime time, there's no interface to let you know if an app has limited access because of you did it on purpose or if there's actually something wrong. Something like a persistent notification seems to be missing here. It's still functional, so you can try it if you want, you just have to install a custom launcher, like Apex or Nova, add an activity to your desktop and find "App Ops" under "Settings", that's all it takes. When you launch the shortcut, you'll be greeted with a list of all your apps categorized into four swipeable sections named "Location", "Personal, "Messaging" and "Device". That makes it really easy to find an app that's using a specific permission. After selecting an app, you'll see a list of all of the permission the app is using, each one with it's own on/off toggle. Do you want an app to stop reading your contacts? Just hit the toggle and it's done, the app will work as always, it just won't be able to read your contacts. This list works in a rather unusual way, which might be another reason why this isn't an official feature yet, which is that instead of just reading every permission the app asked for when it was installed, it seems to be listening to every time the app tries to access a new permission and start building a list from scratch. There's no way of knowing if the list includes all of the permissions for an app, it just shows the ones that have been used, this means that you can't turn a permission off unless the app already accessed it at least once. Seems like a pretty annoying way of handling this. If you want to play with this, go ahead, but don't forget that you might break an app which depends on certain permissions. If you happen to break something, we warned you.